One of the biggest benefits I get from writing newsletters (Mining Stock and Short Seller’s Journal) is that I get “grassroots Main Street” intel from subscribers. This has led to some invavluable insights into the housing market and the general economy all over the country. Heard from a friend east of the Atlantic that things are worse than are even being reported by alternative media. I bet the only thing the banks would like more is if the Chinese took another week off! I also heard next week could be big trouble. ‎My friend’s employer is a financial institution in Europe – you can probably guess which country. 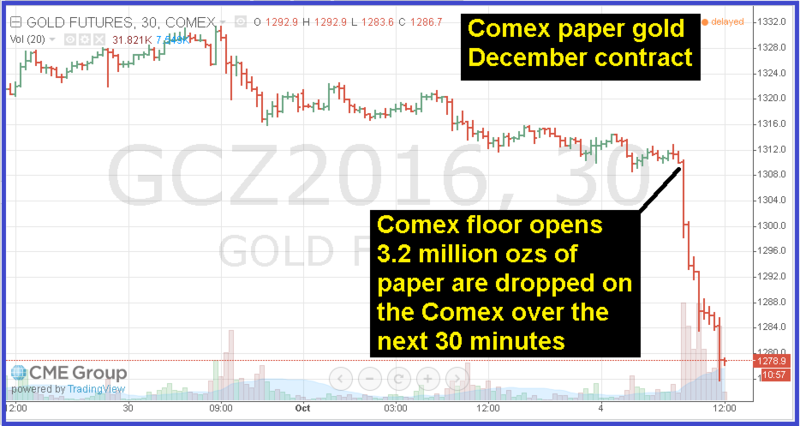 Words used were “chaos” and “possible shutdown.” Advised to buy silver as much as possible. I tried to pull more info out of him but he was understandably compelled to pass on generalities in order to protect the identity of his friend. Both DB and CS have significantly underperformed the benchmark bank index since early March. The index is composed of U.S. Too Big To Fail and super-regional banks. With all the “smoke” coming from DB, it’s entirely possible that Credit Suisse is either inextricably tied to the fate of DB via a perilous derivatives counterparty relationship or CS has catastrophic problems of its own that swirling around but receiving less media attention. The reality is that all of the U.S. Too Big To Fail banks are also inextricably tied to DB through OTC derivatives counterparty relationships. DB was excessively aggressive in underwriting exotic energy-related derivatives both in the U.S. and Canada (this comes from an inside source of mine), which means that JP Morgan and Citi, specifically among several others, are tied to DB’s fate. As detailed here, Deutsche Bank received two bailouts from the Fed and the Government approaching $100 billion in 2008: U.S. Taxpayers Bailout DB. Without question, this is because the big U.S. banks are tied at the hip to the fate of DB. I have no doubt that Fed is using its resources to help the German Government and the ECB keep DB propped up for now. I also have no doubt that there are huge hidden financial bombs at DB that the Fed et al will be unable to locate before they detonate. I would suggest that notion is reflected in the warning above passed on to me yesterday. Currently the fate of Deutsche Bank is the most discussed topic in the financial markets. The stock price is rumor-driven, the most recent of which were unsubstantiated rumors of a settlement with the Justice Department that drove the stock up 14% last Friday. As it turns out, the bank has not yet initiated face-to-face settlement discussions. The gyrations of this stock are like the exaggerated “wobbles” of a spinning top right before it drops the floor (or table-top). Make no mistake, DB will collapse absent a bailout by the German Government – likely in collusion with the Fed, ECB and BoE – or a bail-in by creditors, including depositors. The cost to buy credit protection on DB’s junior debt moved up to a new record high today. Certainly the OTC derivatives market is not convinced that DB CEO, John Cryan, is being forthright in his pleas to the market proclaiming that everything is under control. Judging from the timing of similar remarks make by Bernanke in reference to the mortgage market and by the CEO’s of Bear Stearns and Lehman, DB could be just a few months away from total collapse. On Thursday last week, DB hit another new all-time low – $11.19 – intra-day Thusday. It closed that day at $11.48, another new all-time low close. Miraculously, a new rumor hit the tape on Friday in which a French media organization tweeted out that the Justice Department and DB agreed to settle the $14 billion mortgage fraud fine levied earlier this month for $5.4 billion. The stock shot up in frenzied short-covering to close @13.09, up 14% from Thursday’s all-time low close. Of course, the French news source back-pedaled away from the certainty of its tweet later in the day. The false rumors are intentionally dropped on the market to incite hedge fund short-covering. There is still a lot of “big money” trapped in big positions in DB stock. The short-covering activity creates a bid into which insiders and those connected to insiders can unload big positions. Over 70 million shares traded on Friday. This was 3.5x the 10-day average daily volume of 21.8mm shares per day and more than 10x the 90-day average volume of 6.9mm shares per day. In other words, Friday’s activity enabled a lot “trapped” longs to move closer to the exit (unload their positions). A much better indicator of what’s going on “behind the curtain” at Deutsche Bank is the report that several hedge fund clients of DB’s withdrew any excess cash held in custody at the banks. This fact was confirmed by the CEO. The other indicator is the cost in the derivatives market to buy default insurance on DB’s bonds. On Friday – even after the French media rumor was floated – the cost buy 1 year default protection on DB’s junior bonds soared to over 600 basis points. To put the cost of this in context, the 1-yr rate on U.S. Treasury bonds is 59 basis points (0.59%). Turkey is not taking over DB and DB was technically insolvent before the Justice Department threw a $14 billion mortgage fraud fine at the bank. Too be sure, if a settlement is announced, I recommend shorting DB after waiting for DB to spike up on that announcement. Too be sure, eventually the German Government, likely in conjunction with the ECB and the Fed, will be forced to bailout DB. DB’s derivatives holdings alone are several times larger than Germany’s GDP. And that’s the liabilities that are visible. I can guarantee that, having worked on a trading desk that often hid positions from internal regulators using derivatives, that DB has a lot of unknown skeletons in the closet. I guarantee that. This up/down rumor-driven trading in DB stock is exactly like the trading that occurred in Enron and Bear Stearns. I shorted Enron in the $40’s and covered it at $12. I covered too soon obviously because of spike-ups on rumors that occurred as the stock approached $10. Same with Bear Stearns, which I shorted in the $20’s. If/when a bailout occurs, it won’t happen until DB stock is well below $10 if not $5. As for the hidden skeletons lurking underneath DB’s published financial statements, here’s another one that popped out and it’s just the tip of the iceberg: Deutsche Bank Charged Over Paschi Accounts As Legal Hits Mount – Bloomberg. If you read the article, you’ll note that Monte Paschi used derivatives trades with Deutsche Bank to hide losses from previous derivatives trades that DB stuffed into the Italian bank. This is exactly the type of activity I witnessed going on at Bankers Trust before DB bought BT. Then DB took the same operational algorithm and increased the use of it exponentially. If you bank with Deutsche Bank, you need to get all of your cash out of any accounts there immediately – unless you don’t care about money. In fact, other than loans you have from Deutsche Bank, I would close any accounts you have with the bank, including and especially any assets held with its wealth management group. There will be no justice served to the people who made $100’s of millions in compensation from DB (see disgraced former CEO, Anshu Jain) through fraud – fraud which has and will result in $100’s of billions of wealth destruction. But you still have time to step-aside and watch the fireworks show from the sidelines. Before I get to the bond buyback farce, it’s safe to say the jump in DB’s stock is fully attributed to the rumor floated in Europe that the ECB was going to consider buying big bank stocks in an effort to shore up the appearance of a “healthy” banking system. Furthermore, DB has been relentlessly sold and shorted since the beginning of 2016, down 31% in 25 trading days. It was due for a technically-driven, dead-cat, short-covering bounce. Central Bank intervention rumors being the perfect catalyst to frighten hedge fund computers into covering shorts and moronic perma-bulls into buying the dip. Let’s first examine this notion of a bond buyback. The first item that will be pointed out by Wall Street puppets is that a bond buyback would enable DB to book accounting gains, thereby padding net income and book value. But the idiocy of this logic is that gains recognized from buying back bonds at a discount are 100% non-revenue, non-cash generating events. In fact, a bond buyback is a use cash – it further erodes the liquidity of the entity buying back bonds or stock. In addition, if DB were to buy back its bonds in the market, why on earth would it pre-announce this? The only result this accomplishes, other than a brief surge in foolish optimism issued by perma-corrupt stock analysts, is to trigger front-running into DB’s bonds thereby increasing the overall cash cost of the bond buyback. DB’s announcement was first reported in the Financial Times. You’ll note the FT asserts that “banks can generate capital gains my buying back bonds at a discount to their face value.” However this is highly misleading because the only “gains” generated are a non-cash generating accounting “gain” that is now permitted. It was an accounting change that was passed after the 2008/2009 collapse which gave banks the ability to fabricate net income for the purposes of padding their retained earnings and therefore their book value. It’s nothing more than legalized fraudulent accounting. The FT alludes to DB having 220 billion euros of liquidity reserves with which to use for a bond buyback. However, glancing at DB’s latest balance sheet, I can only find 102 billion consisting of 27 billion euros in cash and cash due from other banks plus 75 billion euros in interest bearing deposits with banks. Notwithstanding the risk embedded in “cash due from others” plus “deposits” with other banks, if DB truly had 220 billion euros of “reserve” liquidity, we would not be having this conversation, DB’s senior credit default swaps would be trading at +100 spread instead of +250, it’s subordinated CDS would be trading at +200 instead of +450 and the stock would still be well above $20 instead of staring down the barrel at $10. But let’s take a closer look at DB’s overall balance sheet, something which clearly no Wall Street analyst or financial bubblevision moron has ever experienced. DB’s latest balance sheet from 9/30/15 shows “total financial assets at fair value” of $881 billion euros; 71 billion euros of “assets available for sale; 428 billion euros in “loans:” and 153 billion euros in “other assets.” All told it reports 1.7 trillion euros in total assets, leading to a declaration of 68 billion euros in “total equity” (book value). That’s an eye-watering leverage ratio of 25x. Now let’s take a look at the quality of the assets listed above. DB has very heavy asset/loan exposure to emerging markets, energy, peripheral European credits (like Greece, Italy and Spain), commodities, Glencore and leveraged finance/high yield. And course there’s the 60 trillion or so in derivatives. But we are leaving that out for purposes of this analysis. Although DB made a big production out of the 6 billion write-down and loss it would take in its third quarter, 5.8 bilion of that was a write-down of goodwill and intangibles. Considering DB’s exposure to the collapsing asset sectors listed above, this 5.8 billion write-down of what amounts to thin air anyway is nothing short of shocking. I would conservatively estimate that the 1.53 trillion euros of financial assets + for sale assets + loans + other assets should be written down by at least 20%. 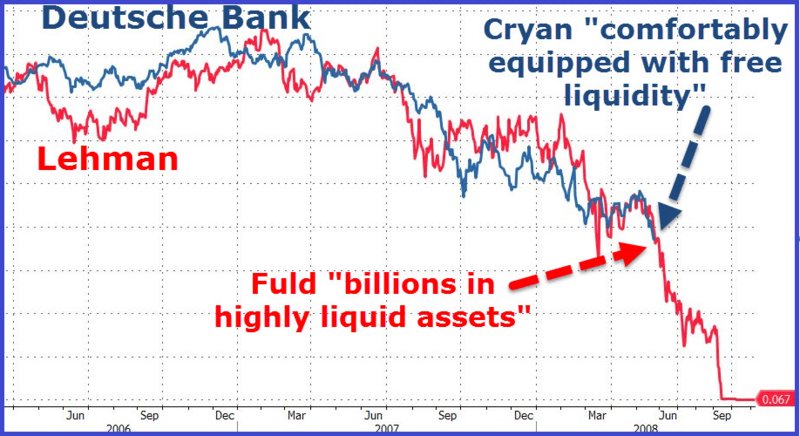 That would imply that, conservatively, DB could write-down its assets 306 billion euros and likely still be overstating the value of its total asset base. A write-down of that magnitude would imply that DB has negative net worth of 238 billion euros. In other words, DB is technically insolvent. When I did this exact same analysis in early 2008 on JP Morgan, Lehman, Wash Mutual and Countrywide, my write-down estimates turned out to be exceedingly conservative. I would wager anything that my analysis above is “exceedingly conservative” x 2. Keep in mind this entire analysis does not include DB’s derivatives. It’s fine with me if DB management wants to puff up its image by taking a few billion of liquidity that it technically does not have and buy back some of its debt. I could care less. But anyone who is not selling their stock into this rally is a complete moron. The only thing demonstrated to me by DB’s bond buyback bravado is that investors learned nothing from 2008/2009 and bank upper management and directors are even more corrupt now than they were 8 years ago.